The whole point of the roadtrip was for my dad's eye surgery in Boston, and so here I sit in the car in a torrential downpour, waiting to go into the small waiting room, magnetblogging away. 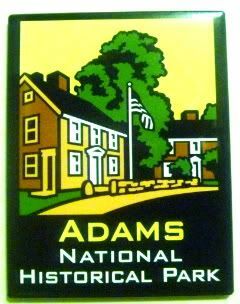 True to form, my parents and I managed to find some fun along the way here - and even more true to form, presidential fun, no less, with the Adams National Historical Park being one of our stops. Such a great way to spend a couple of hours. It starts out at their nice visitors center - truly our tax dollars at work - with screenings of the History/Discovery channel videos of Adams (x2), and then you get a fun, if slide-y, trolley ride to the two sites. First, you get a house tour of John Adams' house when he was born (that's the house on the right), and then the house on the right, where his son, John Quincy Adams, lived growing up. Then the trolley takes you down to where John and Abigail lived during their time in the White House. Called Peacefield, it was really considered the summer White House, a really cool house museum, where the majority of the collection is authentic to the Adams family. Which is crazy, cuz when you walk through the house, it's as though you've stepped back in time to the late 1700s, with wallpaper you're not supposed to touch, artifacts and paintings you're not supposed to touch, and furniture...you're not supposed to touch. Mind you, the Adams descendants are free to roam about the house like it's theirs (I mean, technically, it is, right? ), which sounds pretty damn cool. Though, I'd love to roam around the standalone library built off to the side of the house. It's two stories, with shelves and shelves and shelves of books. And on his giant table (which was supposedly brought down to the White House and back), there were several Bibles, including one presented to John Quincy Adams by the Mendi people, the folks he defended over L'Amistad. But, that's what I find cool about Massachusetts, between this park, Bunker Hill, and Minuteman Park - it makes the birth of our nation come alive. It puts our history into context, and it gives us a sense of what those rabblerousing colonists were up to. Speaking of rabblerousing...remember that no touching rule? I nearly smacked my dad's hand when he started lightly knocking on a couple of the wooden bureaus in the house. It's what he does. Anywhere. And everywhere. He knocks on wood. I mean - wood beams, joints, furniture, casings - everything. Being a pretty good carpenter himself, he admires the handiwork, and I think, there's a part of him that connects with history whenever he does it. So sorry, NPS. Mind you, I'll confess to having taken a picture or four in the library. I was just hiding from the tour guide to surreptitiously take pictures for a librarian friend of mine. But, from what I heard from the guide, that Bible from the Mendi? It was stolen several years ago...leaving them to install security cameras. Ummmm, oops? No, really, so sorry, NPS. But, dudes, the Adamses had a Webster's Dictionary. Volumes ONE. And TWO!!! Whoa!